Horace Luke, son of Estell Nash and Perry Luke, was the second fatality of the Johnson-Luke Feud in the Summer of 1926. 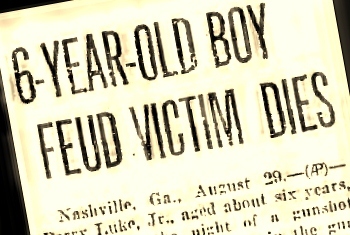 On a Saturday afternoon, August 28, 1926 the young boy was riding with his parents to pick up his grandmother, Lucretia “Cresie” Luke, at her home near Ray City, GA when the family was accosted by an “in-law.” In the ensuing gun battle, the boy’s parents were both wounded, his uncle Lonnie Johnson was killed with a shotgun blast, and Horace was fatally wounded in the chest. He died on Sunday, August 29, 1926. Nashville, Ga., August 29. Perry Luke, Jr. aged about six years, died during the night of a gunshot wound received yesterday in the gun battle staged in the Johnson-Luke family feud. The boy was wounded in the chest by bullets fired during a gunshot battle staged on a highway near here in which Lonnie Johnson, 35, of Daytona, Fla., formerly of Berrien county, was killed, Perry Luke was shot in the shoulder and Mrs. Perry Luke was shot through the neck, the bullet coming out at the mouth. Lonnie Johnson, just back from Florida, who was in an automobile with his wife, is said to have driven to the home of Walter Luke, informing him that he was going to wipe out the family of Walter’s brother, Perry, on sight. At the time, according to information in the hands of county officers, Lonnie Johnson, who married a sister of Mrs. Perry Luke, ascertained that Perry Luke had gone to the home of his mother, to get her to spend Sunday with them. The mother resides on the highway between Adel and Ray City. As Johnson drove away rapidly in the direction of the residence of his mother, Walter Luke, cranked up his truck and obtained his shotgun and started in pursuit, but the automobile outran the truck in the chase. When approaching the residence of his mother, Walter Luke found Lonnie Johnson’s car turned across the highway, blocking traffic, while he said Lonnie Johnson was shooting into the car containing his brother and the members of his family. As he climbed out of the truck Walter Luke says that Lonnie Johnson turned his pistol upon him, but Walter Luke opened fire with his shotgun and killed Johnson almost instantly. Lonnie Johnson was killed on August 28, 1926 by a shotgun blast fired by his brother-in-law Walter Luke. 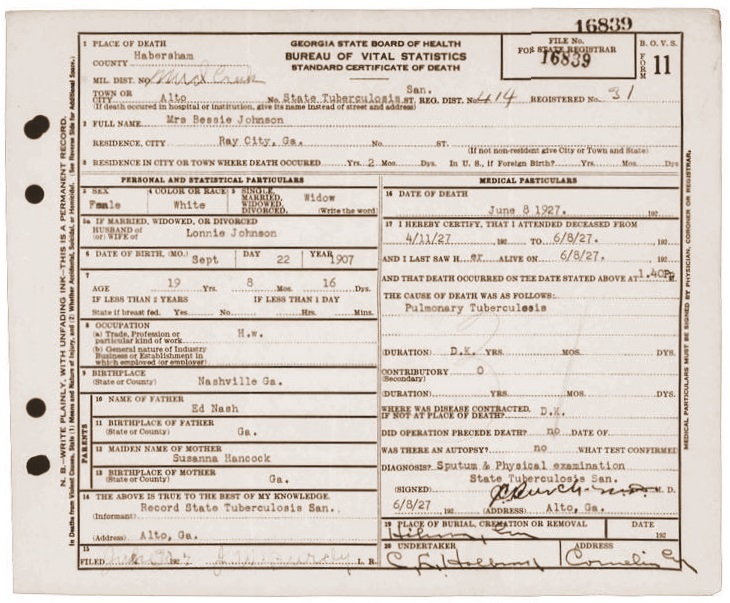 Father-in-law Edward C. Nash was the informant on Johnson’s death certificate. The location of Lonnie Johnson’s grave is not known. 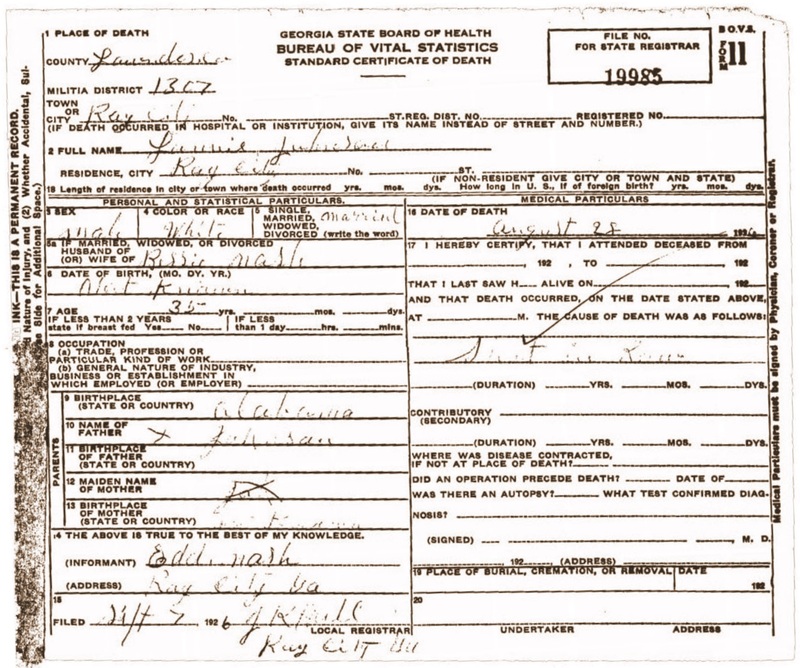 Death Certificate of Lonnie Johnson, August 28, 1926. Horace Luke, shot in the chest by Lonnie Johnson, died the following day, on Sunday, August 29, 1926. 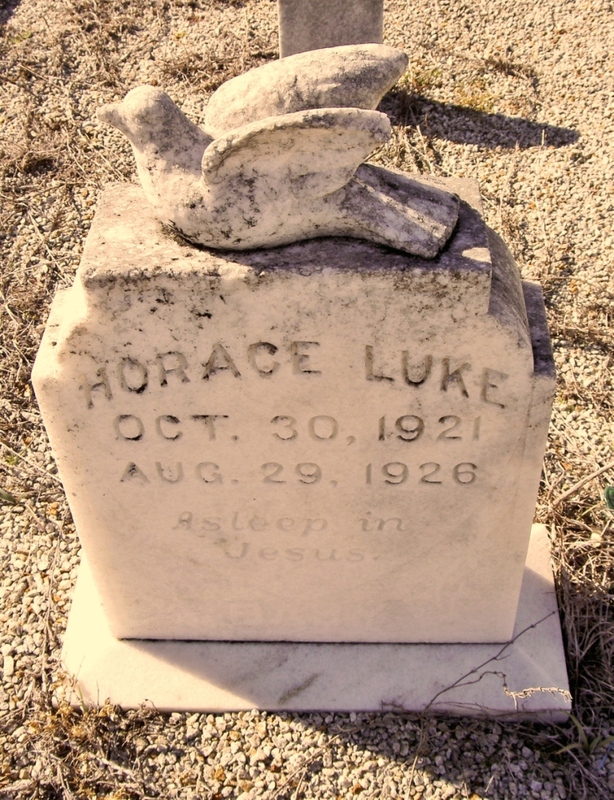 Horace Luke was buried at Flat Creek Cemetery, north of Nashville, GA. Grave marker of Horace Luke, Flat Creek Cemetery, Berrien County, GA.
Bessie Nash Johnson was uninjured in the feud. She contracted tuberculosis and went to the State Tuberculosis Sanitarium at Alto, GA. She died less than a year after the gun battle, passing from this life on June 7, 1927. Mrs. W. P. Luke, well known and highly esteemd [sic] Berrien county lady, died Tusday [sic] morning at 11 o’clock at her home 14 miles south of Nashville on the Nashville-Valdosta highway. She had been ill since September. The deceased, who was 33 years of age, was a daughter of Mr. and Mrs. Ed C. Nash, who reside near Lake Park, but former Berrien county citizens. Mrs. Luke was born and reared in this county, and was married to Mr. Luke about 15 years ago. Funeral services were held Wednesday morning at 11 o’clock at Flat Creek church, conducted by Rev. A.H. Giddens and Elder John Harris of Valdosta, and lasting tributes were paid to the life of the deceased. The pall-bearers were Messrs T.B. McDonald, John Stalvey, Jim Willer, John Chason, J.A. Sapp and J.T. Herring. Arrangements and burial were in charge of the Giddens Funeral Home of Nashville. Surviving are the husband, three sons, two daughters, two brothers and one sister. Perry Luke, shot in the shoulder, survived and lived to age 63. He died September 26, 1963 and was buried at Flat Creek Church Cemetery, Berrien County, GA.
Walter Luke was not injured in the battle. He died June 8, 1975 in Lowndes County, GA.